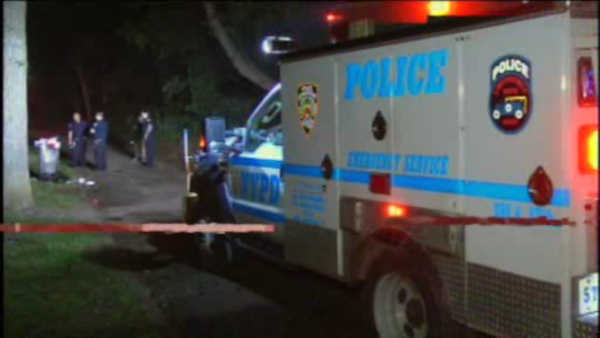 BELMONT, Bronx (WABC) -- Three people are in the hospital after shots rang out at a fraternity barbecue in Van Cortlandt Park that witnesses describe as "pure panic." Late Saturday night, alcohol and food still littered the scene as police flooded the park. Detectives looked for clues in the dark, while police searched from the sky. The identities of the victims are not known. A dispute broke out inside the park near 240th Street and Broadway around 10:30 p.m.
"So I'm just spending some family time with my friends and family in Van Cortlandt Park," witness Jonas Cabrera said. "We happened to see there was an after-party going on right next to us. We just randomly heard a couple shots happening, so after that, everyone evacuated." All three victims were rushed to St. Barnabas Hospital in stable condition. They are all expected to survive.